Hey Lovelies! 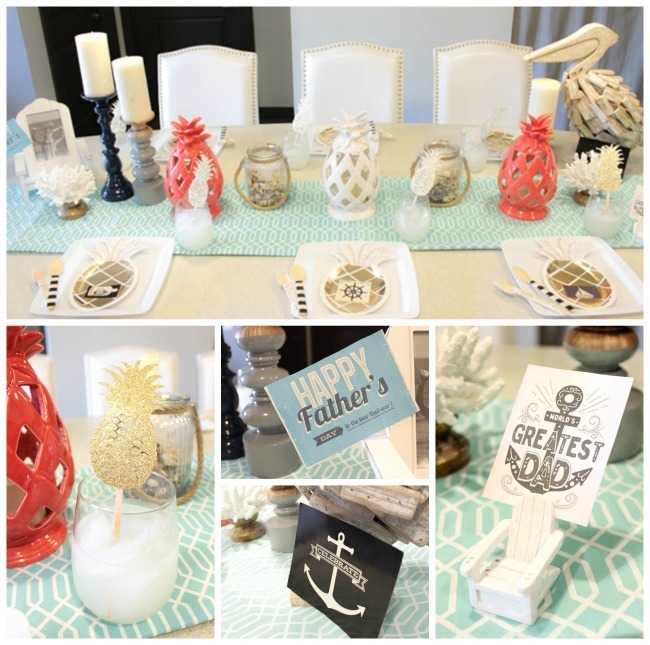 Today we have a super lovely nautical pineapple Father’s Day Tablescape. 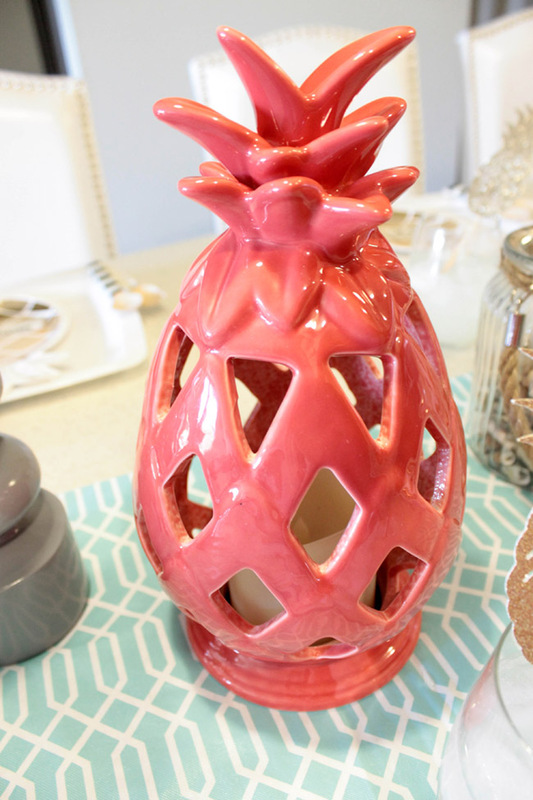 We are totally loving the pineapple trend right now. They are so adorable on everything! Because pineapples are so versatile and work well for almost anything, they will totally work for a lovely Father’s Day Tablescape too. Nautical is starting to be really trending this year two. We though it would be lovely to mix the two together. 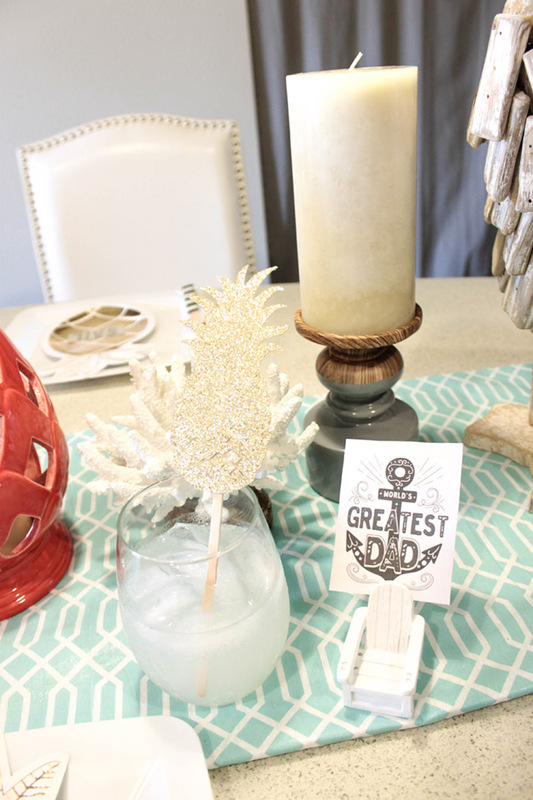 This Father’s Day table setting It gives the Father’s Day table setting a perfect “Tommy Bahama” feel for Dad. We love this tablescape for a lovely brunch, lunch or dinner for dad. Because it is so light and whimsical, it works for almost any time. We’ll take you through all of the fabulous décor Jo-Ann Fabric and Craft Stores has to pull this one together! 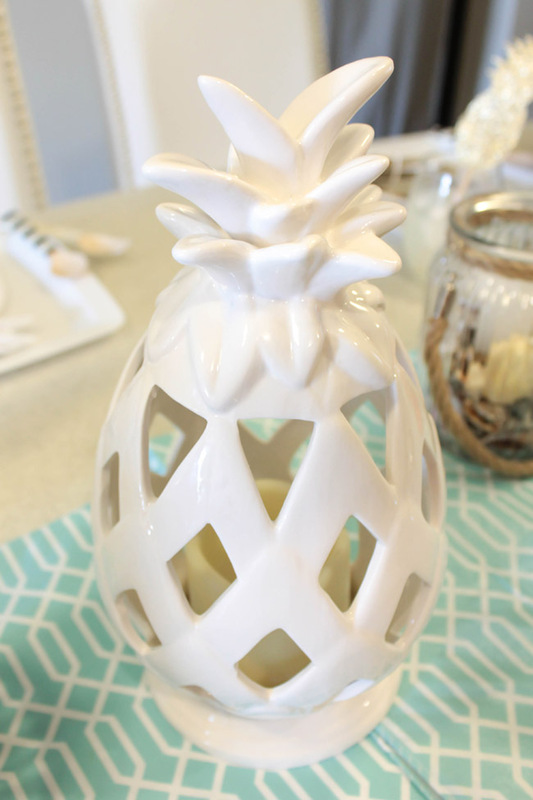 When I spotted the new pineapple lanterns at Jo-Ann, we immediately fell in love. They have such a chic beachy vibe and are perfect for summer. They come in all different colors like yellow, red and white and have little LED candles inside of them. We can’t image how lovely these are on a table at night! They paired perfectly with this blue geometric modern patterned tablecloth for a modern sophisticated beach look. 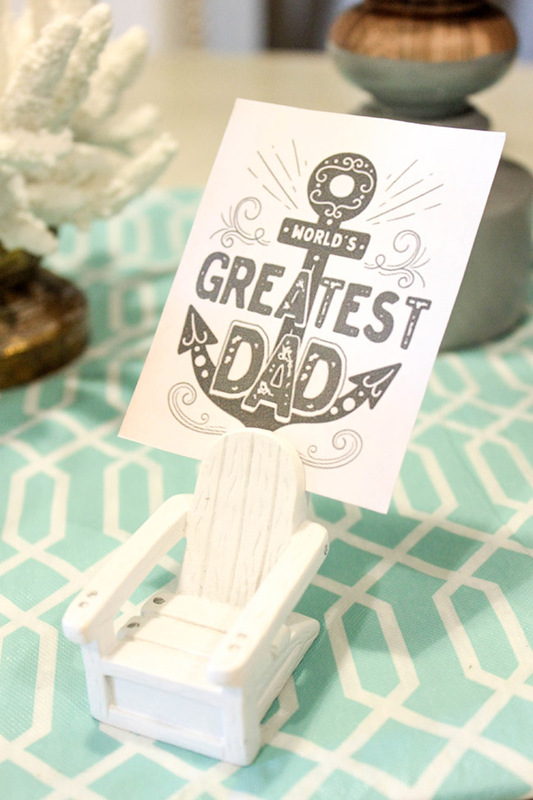 This beach chair picture holder is completely adorable and works so well with the nautical vibe of this Father’s Day table. Put your own beach pictures in in for a sentimental treat for Dad on his big day. Then he can take it and put in on his desk or around the home. It truly is a gift that keeps on giving. 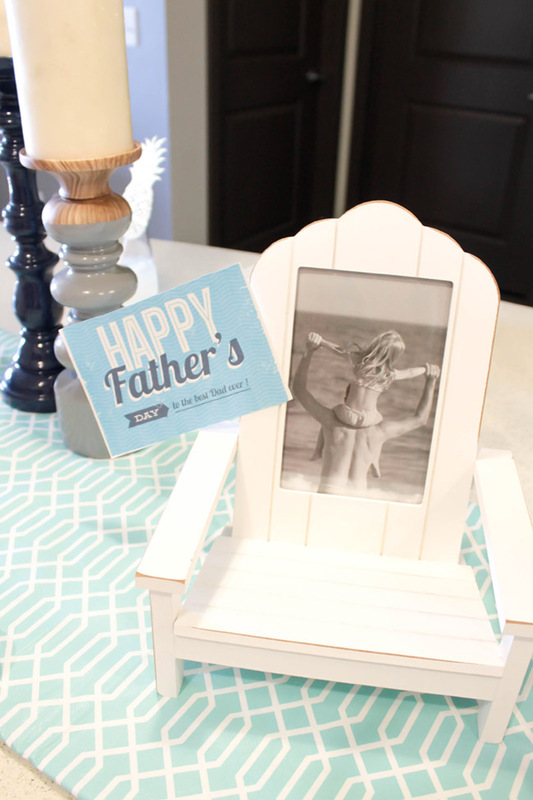 Add in a Happy Father’s Day sign so Dad knows the table is just for him on Father’s Day! 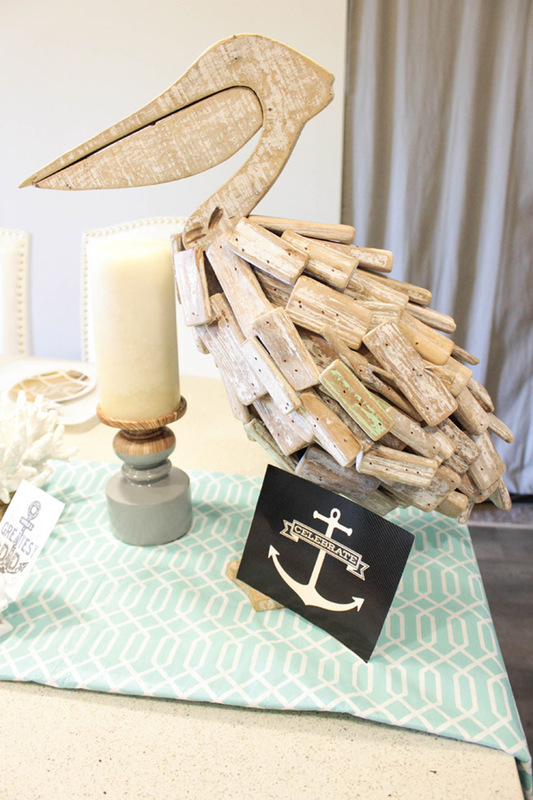 We LOVE this driftwood pelican. 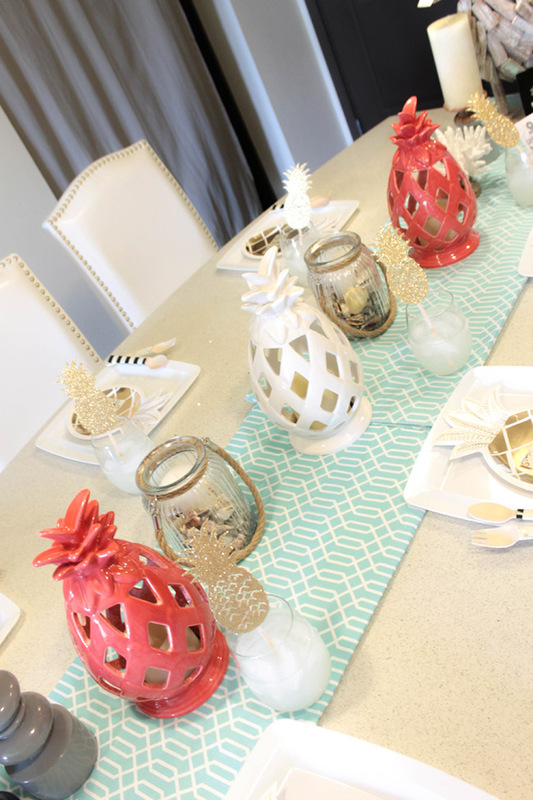 It is so beachy and really makes a statement on the table. 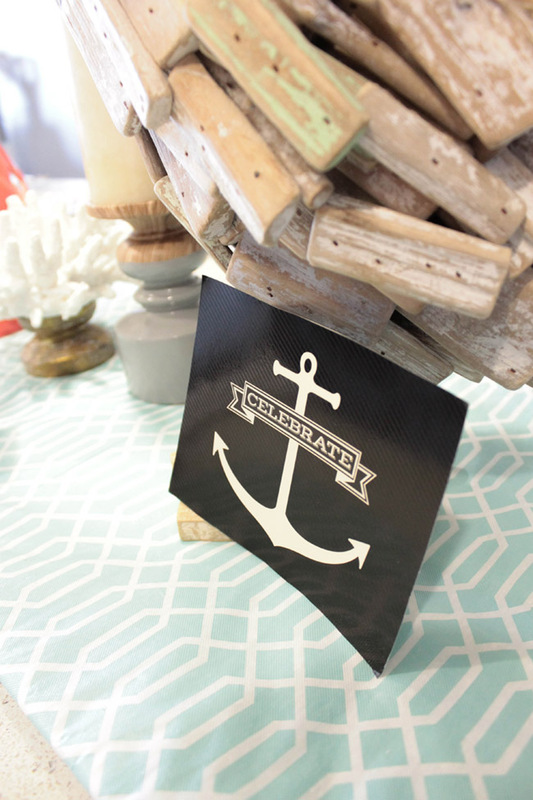 Add in a cute scrapbook detail like this Celebrate Anchor from the DCWV Hey Sailor Stack to give it even more character. 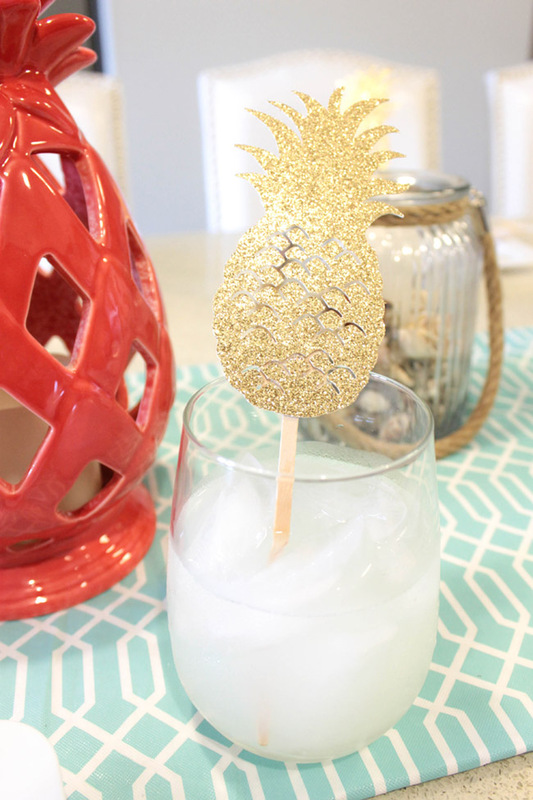 Add in a little gold glitter pineapple drink stirrer to spruce up the drinks on the table! 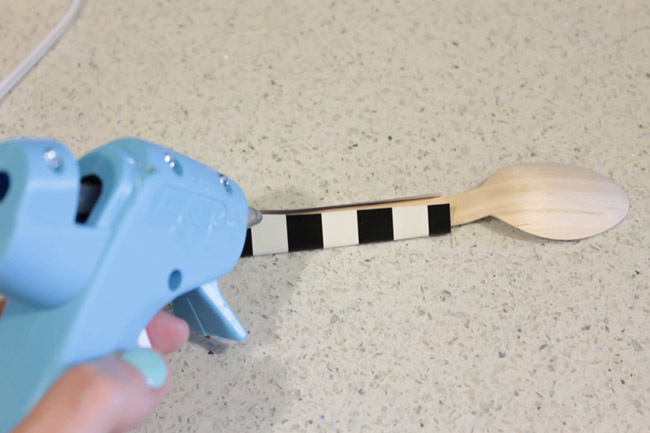 This is a really easy DIY too! Grab some gold glitter cardstock, get the pineapple template in the Cricut Design Space and cut it out with your Cricut. Then take some wooden drink stirrers, and hot glue your gold glitter pineapples to the top of it. Then stick it in your favorite drink! 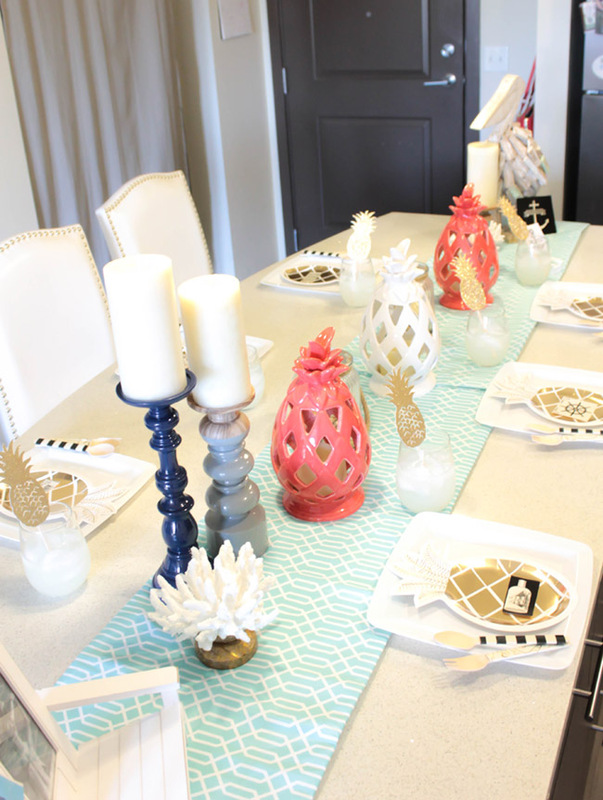 These gold pineapple place settings are really lovely and are completely disposable! I got the gold pineapple plates from Meri Meri, and the white square plastic plates and wooden spoons from Party City. I’ll show you a quick and easy DIY on how to wrap the silverware with your favorite scrapbook paper at the end of this post. 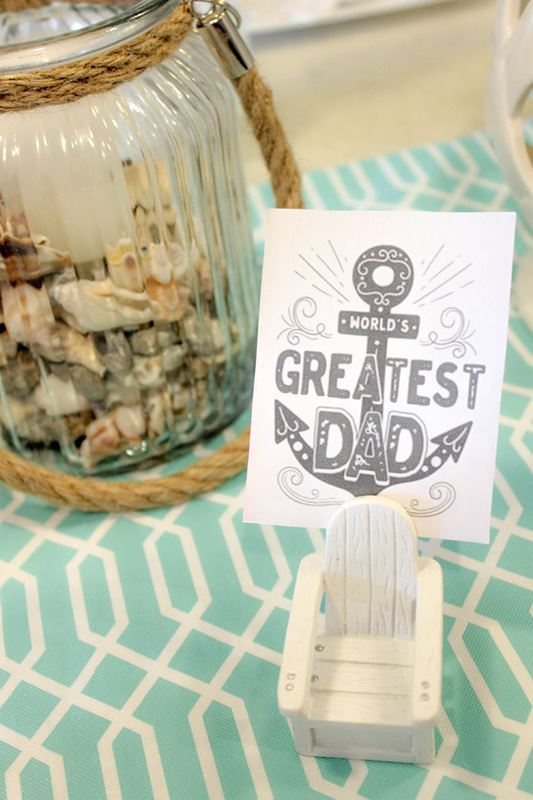 Add in details like World’s Greatest Dad to really make is special for Father’s Day. 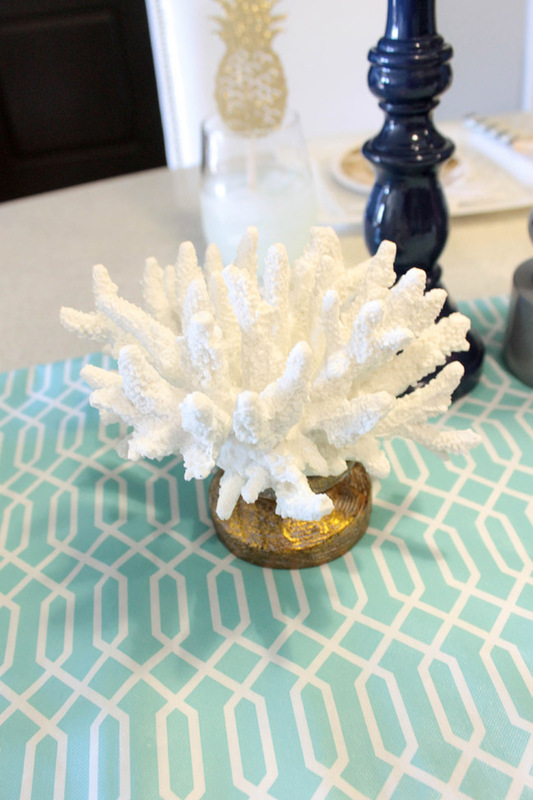 Continue the beachy, nautical look and feel for your table with these amazing Hudson white coral décor piece. We love the gold base to it and the beautiful white coral texture to it. 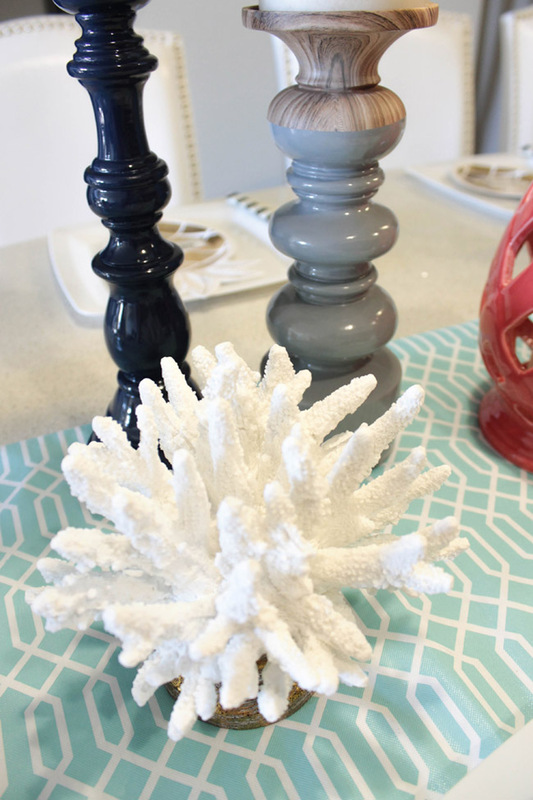 We love these modern color block wooden candle sticks that Jo-Ann has. They are manly yet, elegant and the wood text ties in to well with the nautical theme. 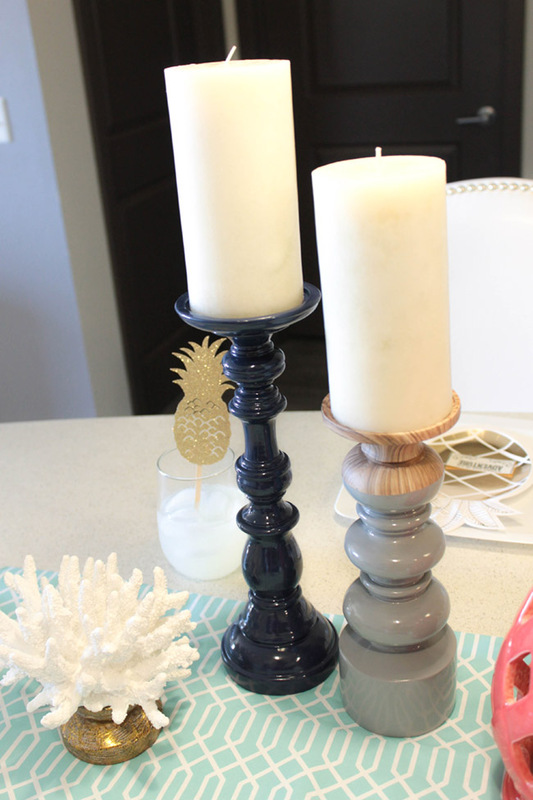 The grey and navy colors also make great accent pieces for the table. Add in some french vanilla pillar candles to bring in a soft aroma and light when you are dining. 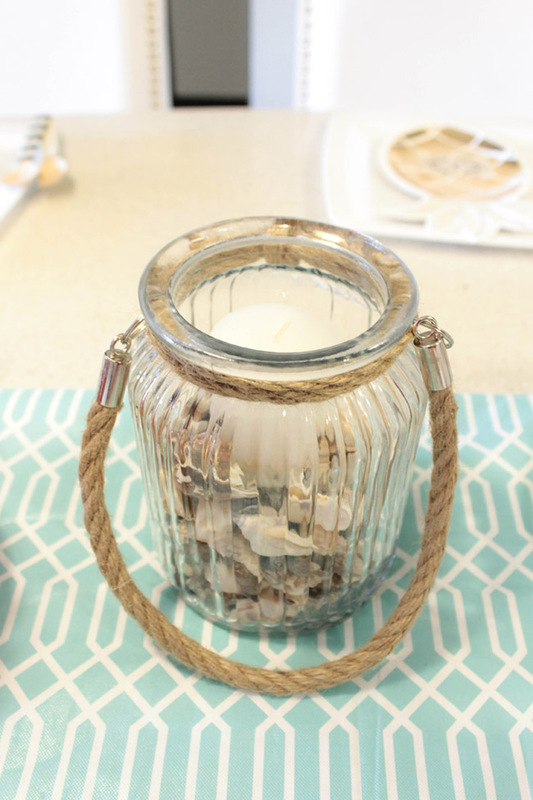 Really add in the beachy nautical vibes with these clear, rope tied lanterns. Fill them with sand or sea shells and add in a small pillar candle to bring light to it too. It all came together in such a lovely way! We are totally loving this look for Dad! 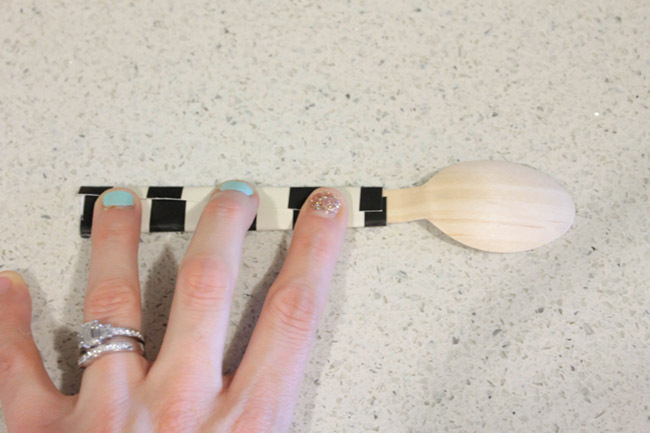 These wooden wrapped utensils are super chic and so easy to make. They add in a fun detail to your place settings and bring in an additional nautical detail to the table too. Step 1– Cut the paper about 1 ½” wide and 4” long. 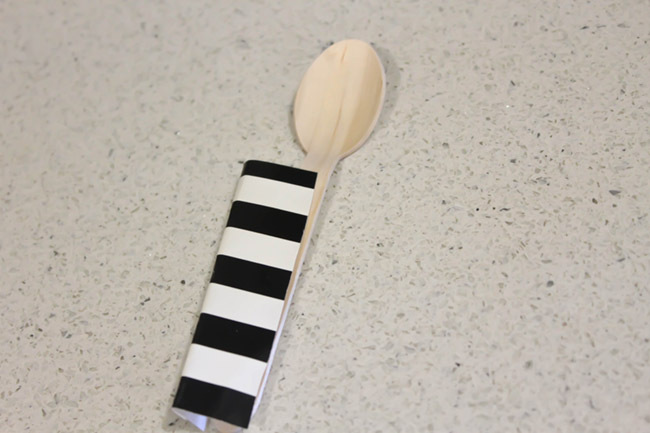 You can measure the best fit for your utensils too. 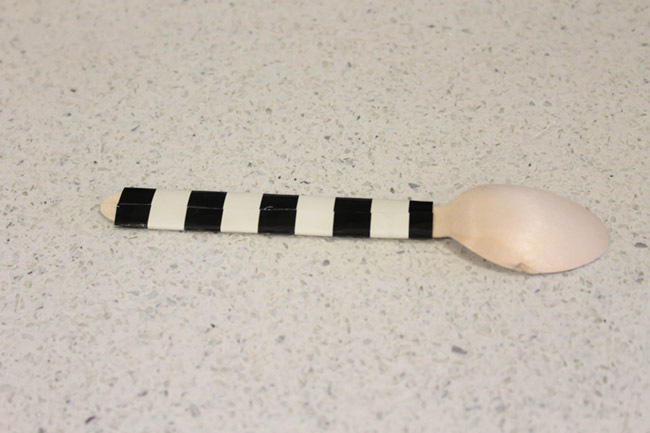 Step 2– Wrap it around the base of your spoon or fork. 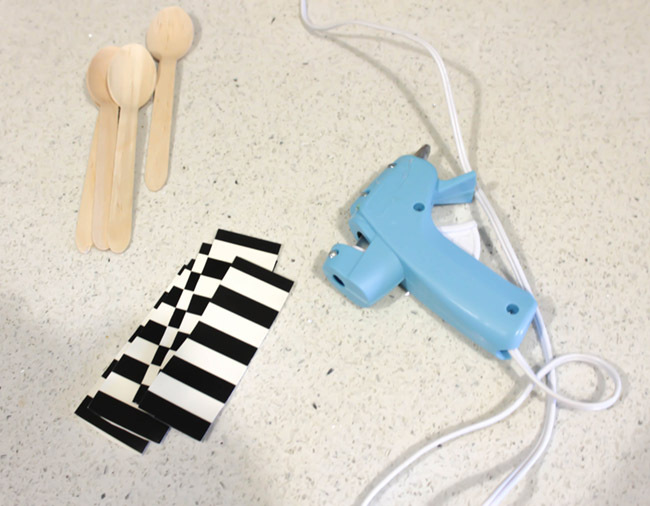 Step 3– Connect the two side on the back of the spoon or fork. Step 5– Let dry. The back should look similar to this. It’s as simple as that. 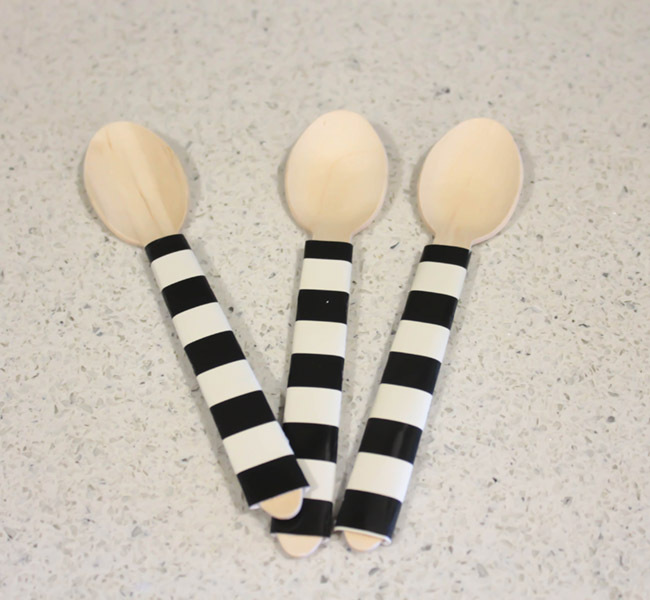 Make 6 spoons and forks for your table You can use any paper you want to create this look but I really liked the stripes and sea shells as a cute detail for the table. 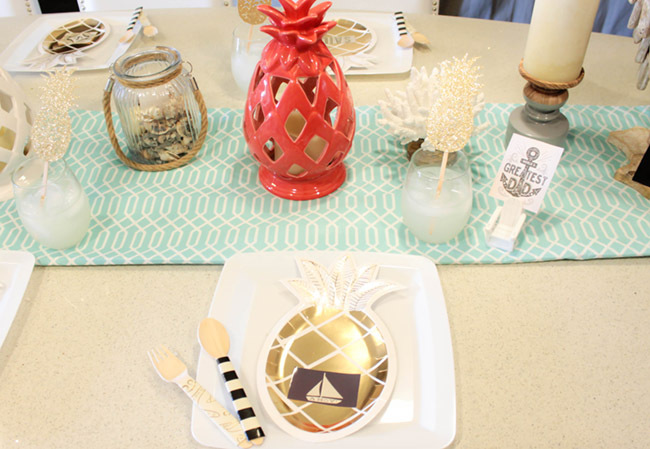 We just love this nautical pineapple Father’s Day tablescape! It is really elegant yet whimsical and really easy to put together with the help of all of the amazing décor and accessories that Jo-Ann has! 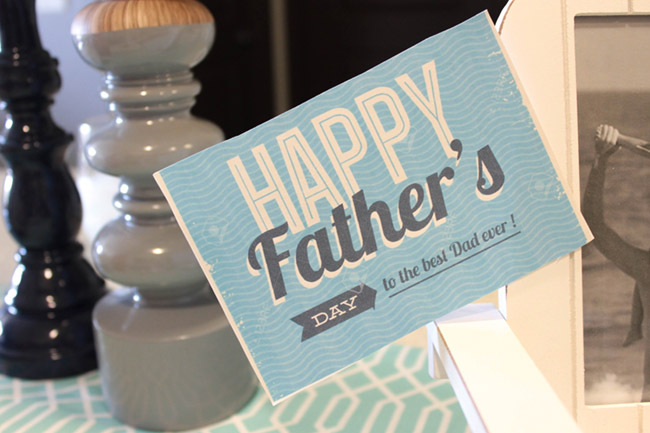 For more Father’s Day Inspiration, be sure to check out our Father’s Day inspiration! How fun. 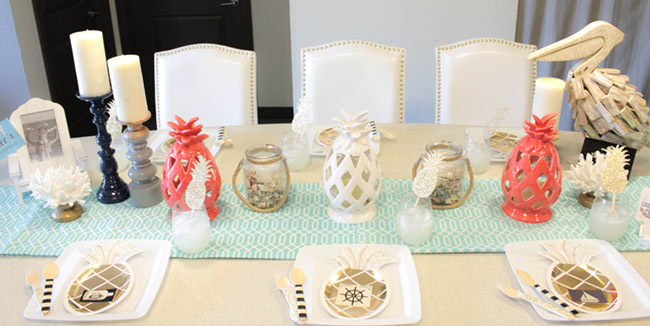 Those pineapple plates are lovely and I really like the driftwood pelican! I could see him living in my house! This is a great table for any summer get together!